June 16, 2016, 6:02 PM · Canada's Musical Instrument Bank -- which has loaned fine instruments to help the early careers of violinists such as James Ehnes, Lara and Scott St. John, Judy Kang, Timothy Chooi and more -- all began about 30 years ago, when Denis Brott couldn't afford to buy a fine instrument. 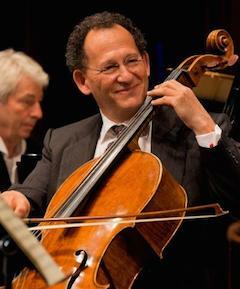 "When I was a student, I had the opportunity to play on an instrument that came from a spectacular collection -- I was very fortunate," said Brott, a cellist who studied with Leonard Rose, Janos Starker and Gregor Piatigorsky and who is currently Executive and Artistic Director of the Montreal Chamber Music Festival and Professor at the Conservatoire de musique du Québec à Montréal. "But then when the time came to give the instrument back, I was left with my own cello, which was not at all at the level of the instrument that I had had." His time and experience playing a fine cello "provided me with an incredibly helpful learning experience about what makes a great instrument and how to choose a great instrument," Brott said. He knew the sound he wanted, but how could he procure a fine instrument? Even in the 1980s, fine instruments were pricey; these days they can be anywhere from several hundred thousand dollars to more than $10 million. "I knew about collections," Brott said. "I thought, we need to have one in Canada. Why not create one that belongs to the country? Something can become part of Canadian heritage in the same way as an art bank? There were art banks, as examples, all over the world." Brott set about making it happen. He wrote to about 50 chief executive officers of various companies to propose his idea. He received just one reply, from William Turner, CEO of the Consolidated Bathurst. But that was enough. "(Turner) was also on the World Bank board and was friends with American movers and shakers, particularly in the art world," Brott said. "When I finally did get an appointment to see him, we went up to his library, where a Beethoven string quartet was on his record player and the art section of the New York Times was on his coffee table. I knew then that I'd come to the right place!" "To make a long story short, Mr. Turner said 'Yes, I'll help you,'" Brott said. Turner had the business acumen and contacts in Canada's business community to get appointments with CEOs and meetings with leaders. "In two days we raised $250,000," Brott said, and the Musical Instrument Bank was started. That was in 1985. By now, the Musical Instrument Bank, which is part of the Canada Council for the Arts, has 22 instruments worth more than $41 million, including 15 violins, six cellos and a cello bow by makers such as Stradivari, Guarneri, Gagliano, Vuillaume and more. The instruments are owned by the country of Canada. One of the instruments is the 1706 David Tecchler cello, which Brott has been given lifetime use for his role in founding the instrument bank. All the other instruments are loaned out via a competition that the Canadian Council holds every three years, open to Canadian citizens who are accomplished young or mid-career musicians. "The person who scores highest has first choice, the second-highest-scoring has second choice, etc. and then the person has the instrument for three years, with a possible renewal of another three years," Brott said. "In some cases there have even been a further three years." The last competition was held in September 2015, and I met three of the musicians who were granted instruments: Nuné Melik with a 1750 Landolfi; Byungchan Lee with a 1768 Gagliano; and Emmanuel Vukovich with a 1700 Tononi. They will be featured in a concert Sunday along with 14 other winners of the Canada Council for the Arts Musical Instrument Bank competition, as part of the Montreal Chamber Music Festival. 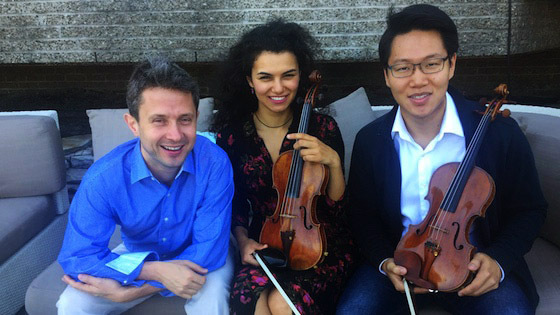 Recipients of Musical Instrument Bank violins, (L-R): Emmanuel Vukovich, Nuné Melik and Byungchan Lee. Photo by Violinist.com. "I was searching for the violin for maybe three years while I was living in New York and studying with Alexander Markov," Melik said. "I was just realizing that my violin wasn't giving me the colors that I was working for, and a lot of people -- musicians and non-musicians -- would approach me after concerts and tell me that I needed to find a new violin because my violin wasn't enough -- even though it's a pretty good violin." "I spent a lot of time and energy trying to get a new violin -- even the ambassador of Armenia was trying to help me get some people to invest in an instrument," Melik said, "but unfortunately it wasn't successful. Then I heard about the Music Instrument Bank. Being a resident of Canada gave me a huge privilege, just to audition for this." Melik feels that being granted the use of a fine instrument has been her biggest break. "For me it was literally life-changing," Melik said. "You feel so much freedom, you can do so much more. It's like having one or two colors for your palette, or having hundreds of them. These instruments are extremely responsive and bright. In my case, I was having difficulty (playing louder than) the orchestra with my previous instrument. Even though I have a Russian big sound, my violin wasn't able to give that sound and cover orchestras. It's just a huge pleasure to play with orchestras, with this instrument. You're the loudest!" "At a certain point, you have to try to find an instrument that's going to help you, not get in your way," Lee said. Looking at instruments in his price range, he had limited options. "My teachers' main comment with my past instrument was, 'You have to play more, you have to give more!" Lee said. "At a certain point, you get diminishing returns." Of course, they will have their instruments for just three years, or six or nine, if renewed. "In the span of a career it's very short, but it's enough time to get to know an instrument," Vukovich said. "An instrument is like a teacher. For example, Menuhin looked back and could see the stages of his career, and also his inner development, based on what instrument he was playing. We play many instruments through our life, so it's a step in our evolution, and it helps us evolve new capacities or new ideas of sound." What can one learn from a fine antique instrument? "Well, that power isn't everything," Lee said. "Generally, I've found modern instruments are a little more robust. After playing on instruments that are old, you start to realize the maturity of sound that is available, and that's what you look for in modern instruments as well: not just pure projection and power." "But also, playing on the really fine instruments develops the ear," Melik said "It develops the aesthetic sense of sound. Maybe the best thing about modern instruments, especially the ones that are made for you, is that you can develop your own sound on the violin. While on the established violins, which are 500 to 600 years old, they have their own sound. Having the conception of the sound from the fine instruments, you can actually create the same sound on the modern violin." "It's like you recognize a color, but you don't know the name of it," Lee said, "and then after you know the name of it, you can describe it. "Or," Vukovich said, "maybe you didn't know that color existed." When they have to give back the violins, they may look for another loan, or for a modern, they said. And these three musicians have already become well-versed in modern-maker options. I'll share with you some of the makers that they named, both Canadian and otherwise. For violins: Denis Cormier and Gideon Baumblatt in Montreal, Sam Zygmuntowicz in New York, Stefan-Peter Greiner in Germany. For bows, Benoit Rolland and Ron Forrester. "As far as I'm aware, the Canada Council Instrument Bank is the only institution of its kind in the world," Vukovich said. "There are private foundations in the U.S., but I think we're very fortunate, as Canadian artists, to have this." Not only that, but artists are not required to pay insurance for the instruments loaned to them by the Canadian Council. For a $1 million Strad, the cost of insurance could be around $5,500 annually, or more. "The instrument bank is a great role model, and for countries who have the potential, the care, the sensibilities, it is certainly building a heritage," Brott said. The only drawback is the fact that, in order to give as many musicians as possible the chance to use these instruments, each musician may use the instrument for only a limited time. "It's hard to give it back, there's no question," Brott said. "But it's worse not to have it." June 17, 2016 at 08:13 PM · There just aren't enough really good instruments to supply all the very good players. Funds like this should also commission new instruments from the best modern makers. That could be a competition, too . . .
June 18, 2016 at 02:16 AM · That's a nice idea, Brent! June 18, 2016 at 05:49 AM · I thought Strads and similar were about 300 years old, and a few a little more. But 500-600 years old? Most talented players can only ever afford a modern instrument, but even so, some of the playing on these is quite superb. Maybe the problem with instruments not projecting above an orchestra is due to orchestras being too large, and conductors being too deaf and incapable of training them to play less.